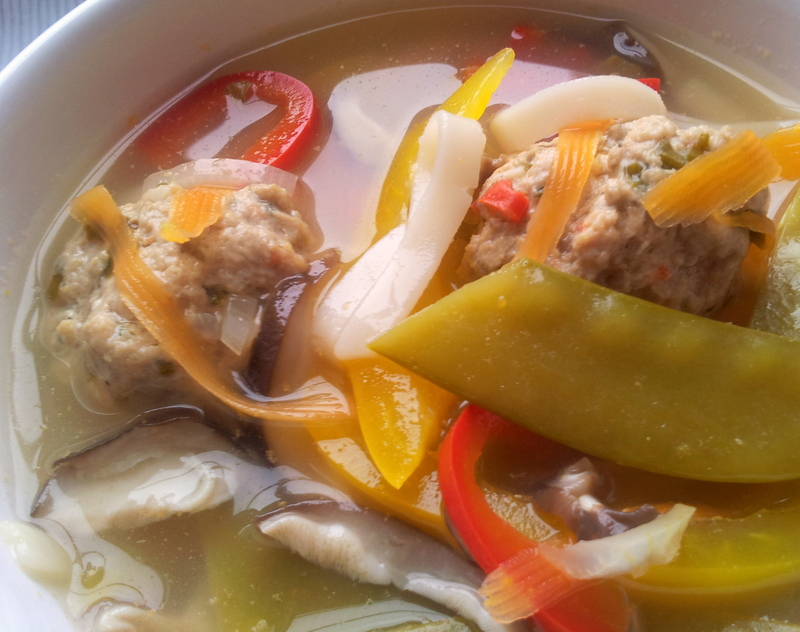 And another cook off: pork and prawns balls in aromatic broth. It is a bit of a foreign taste to my Mediterranean roots, but still delicious enough to me go back to it over and over again. Nothing that I would cook for myself, though. Never having cooked them before, the broths seem too complex and the flavours seem to be quite hard to get in the right proportions. But, this Hairy Dieter’s version seemed achievable. A lot of work, but still, within my possibilities… Halfway through the process, there was a lot of huffing, puffing and fiddling around. Indeed it soon become a full blown mess, which included the mixer to go on strike to never work again. To make matters worse, it wasn’t as delicious as one would expect after all process. Well, maybe I haven’t “followed the recipe to the letter”, as The Hairy Dieter’s strong recommend, but after all this effort, I was somehow expecting something a bit more elevated… It is very unlikely I will try it again. Start with the broth, pour the stock in a large saucepan. Bring to a simmer and add the lemongrass stalks. Split w of the chillies lengthways almost all the way through and pop them in the pan. Add the lime leaves, half the sliced shallots and finally, all the ginger and garlic. Bring the broth to a low simmer and cook gently for 20min. Remove the pan from the heat and leave to stand for about 30min. While waiting for the broth to cool down, start the balls. Put the minced pork and prawns in a large bowl. Add the chopped shallots, garlic, deseeded chilli, cornflour, salt and lots of freshly ground black pepper in food processor. Blend to make a tick, slightly textured purée. Add the coriander leaves and it another quick blitz until just combined. Take out the processor blade the roll the pork and prawn mixture into 20 small balls. Strain the infused stock through a sieve into a clean pan. Stir in the remaining sliced shallot, lime juice and fish sauce. Stir in the remaining chillies, very finely chopped. Bring to a gentle simmer and add to the pork balls. Let it cook for 5 minutes, allowing the liquid to bubble gently. In the meanwhile, cut the carrots into large ribbons using a vegetable peeler. Deseed the peppers and slice them thinly; clean and slice the mushrooms. Trim the mangetout and cut them in half diagonally. Still the carrot strips, mushrooms, mange tout, peppers and noodles into the broth and let it simmer for 3-4min more, or until the pork balls are cooked through and the vegetables and noodles are just tender, stirring occasionally. Ladle the broth into deep bowls and scatter the coriander on the top.